Leon Wu is the Founder and CEO of bespoke and ready-to-wear clothing line, Sharpe Suiting. 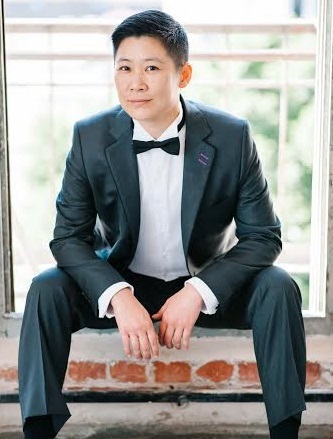 At Sharpe, Wu created the trademarked formula for ‘Andropometics’, which revolutionizes how one measures the body based on an individual’s gender identity. Using nearly 4000 body measurements from over 250 bespoke clients, Wu developed a new standardized sizing for the Sharpe gender-neutral ready-to-wear line, available online and in store Fall of 2015, to luxury retail consumers in US and Canada. With a history in genderqueer design, style and performance, Wu has also taken on speaking and fashion industry events as a decade-long expert in the area, judge, and styling consultant. Wu holds a B.A. in Economics at UCLA and an M.B.A. at New York University Stern School of Business with an emphasis on Marketing, Change Leadership and Luxury & Retail. Change. My passion is to lead change in the world. Right now it’s to revolutionize the way we look at gender through fashion. Throughout my career, I’ve thrived on the most challenging assignments, and been able to seamlessly deliver certain process or solutions to be more organized, smooth and efficient, and effectively producing returns. It quickly became important to focus these skills into driving change from within the business world. I’ve worked long and hard to further my skills, and to build a business that would change the world. Our business is focused on connecting to an individual at any given moment throughout a product or service delivery. My team focuses on the quality of the client experience in addition to the product and service. When this company came to be, I realized that there is no ultimate product or service which can effectively match today’s modern complex marketplace. That is because in today’s world, in the face of such market diversity, marketing is all about personalization. The more personalized we can make a product or service, the better the business. Through the experience we deliver, we strive to connect with the client and develop a personalized commitment to their sense of empowerment and style. Delivering these provisions to a community that represents a market share that has often been historically underserved is especially rewarding. We see the answer in innovation, and thinking outside of the box. In my experience, many organizations in the corporate world are predominantly looking to maximize margins through cost reduction. As CEO at Sharpe I push myself to steer a different path. In this industry the made-to-measure process has developed to include custom tailoring originally invented to streamline production. But with multiple fittings, efforts put into fixing a less customized system in the delivery phase turn out to decompensate the cost savings. Alterations done after a suit has been constructed jeopardize the quality of the suit. More concerning is the loss of the art of couture and the whole premise of custom and bespoke, which we (and our clients) cherish. We want to bring back the quality of bespoke couture, while keeping the focus on also catering to the budgets and measurements of our clients. And so we’ve innovated responsively, developing a new system of sizing and reinventing the styles of menswear that our diverse clientele seek to match their own varied modes of style. Personal: To love and connect with as many people as possible. (This coincides wonderfully with my business aspirations). Business: To change the world to be more socially accepting of all identities and genders through style, with our incredible community of clients and the people who make up this company and work hard at my side. People, in all their diversity. We are the biggest assets on this planet. Whether we choose to love or hate each other will determine how well we thrive. My hope is to inspire others to change the world through creating positive social impact. In my eyes, Sharpe has accomplished so much of this - from clothing a community that has rarely been able to feel well-dressed in their most important life moments to enabling a more diverse range of style representations to be seen in fashion. Franklin D Roosevelt, for creating a system of economic structure and social welfare during a time of monopolies and chaotic banking systems that developed as a result of the industrial revolution and rapid technical advancements. Bruce Lee for his keen focus on perfection, and consistent endeavor to physical and mental growth. London. As a place I spent over a year in, and look forward to returning to, I admire the country for its commitment to investing socio-economically. The life-long friends I made there (as well as my experiences of the general public) have a real genuine care for others, as well as a genuine sense of global social responsibility. L’Occitane, Art of Shaving, Goorin Bros… Great branding. Fashion | Entertainment. All as vehicles for impacting positive social or political change - we’ve had the fortune to clothe many tastemakers in these communities, and we’re looking forward to continuing to do so. As a personal career endeavor, I enjoy contributing similar efforts and philanthropy through entertainment as well. These two industries are a labor of passionate love.